The cargo industry has been clear it is suffering from the external problem of weakened supply amid a gloomy economic environment. But less apparent is the fact that the pain is largely self-inflicted: long-haul passenger flights are growing rapidly, increasing 25% on trans-Pacific routes between 2006 and 2013. That also directly increases the amount of belly capacity available for cargo, and the trans-Pacific is the world's largest cargo market. Increasingly the aircraft of choice across the Pacific is the 777-300ER, which can carry upwards of 18% more cargo volume than the 747-400. And the 777-300ER is displacing the 747-400, with the twinjet increasing its share of trans-Pacific flights from less than 1% in 2006 to 27% in 2013. 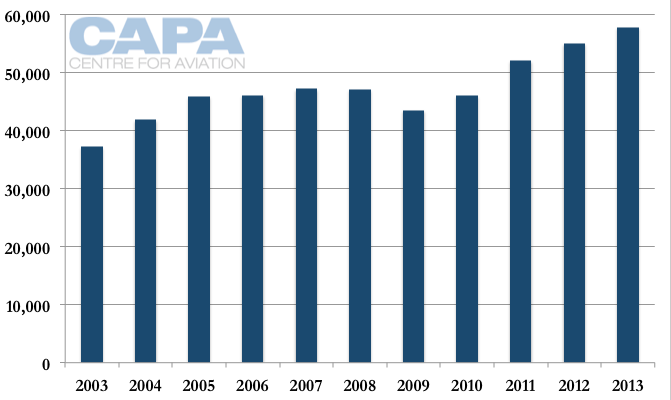 The 747-400 meanwhile accounted for 40% of flights in 2006 but only 15% in 2013. This trend is structural and ongoing as carriers look to add trans-Pacific passenger capacity. Northeast and Southeast Asian carriers hold 29% of the 777-300ER backlog, and airframe manufacturers plan for their next-generation aircraft to carry even more cargo. This all brings into focus: just how strong is the future for dedicated freighters? The largest one-way global cargo market measured in FTKs is between Asia and North America, comprising 10% of global FTKs in 2011, according to Airbus. (Roundtrip to and from Asia, the market has a 17% share.) This is expected to grow to 21% by 2031, with the China-North America sub-market accounting for over 75% of the total Asia-North America market. Airbus expects China-North America FTKs to grow by 6.5% to 2031 while Asia (non-China)-North America will grow by a slower 4.1%. Boeing forecasts an overall 5.7% growth from Asia (including China) to North America to 2031, ahead of its 5.2% global growth forecast. A structural change in the largest market is significant in its own right as well as for its potential flow-on impacts: pressure falling on the largest market impacts the feasibility of manufacturing new freighters that would also be used in other, lesser regions. The impact from passenger flights on the Asia-North America cargo market facilitates a comprehensive analysis, unlike Asia-Europe where significant passenger and freight traffic is diverted through the Middle East (Dubai’s new Al Maktoum International Airport expects to be the world’s largest cargo hub). 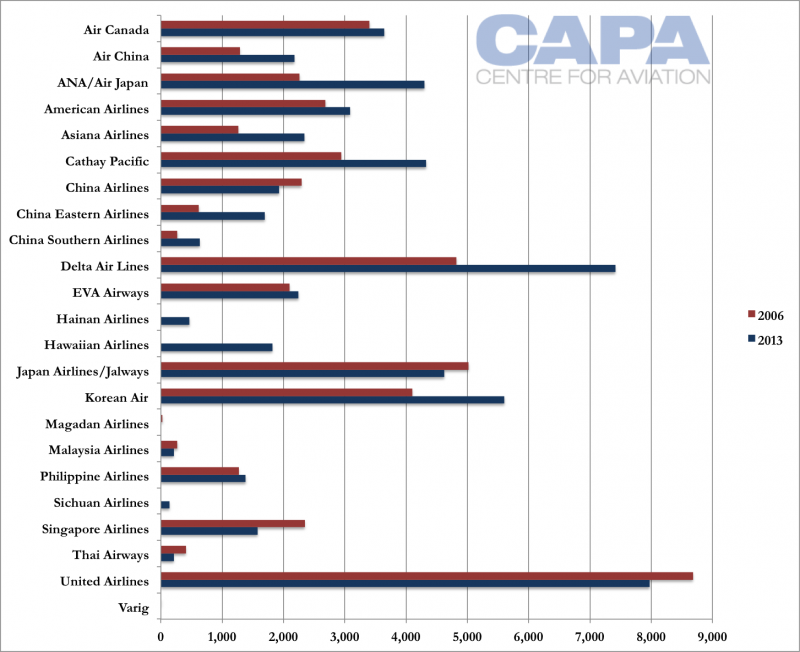 The implications are greater on Asian carriers as they, unlike their North American counterparts, operate dedicated freighter aircraft, and it is they which are the main focus of this report. 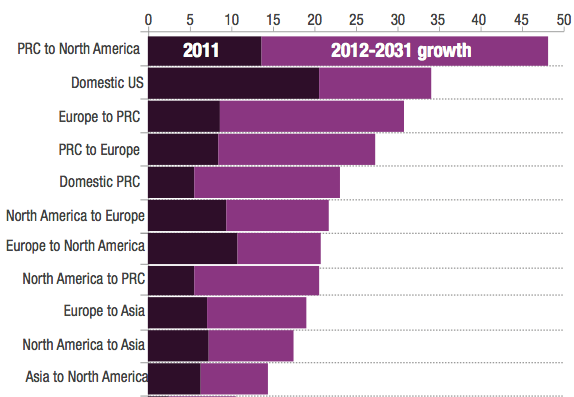 Aside from a blip in 2009 during the global economic downturn, trans-Pacific flights have grown over the last decade. Frequencies from 2006, prior to the economic downturn, grew by 25% in 2013, the equivalent of four additional daily flights every year. 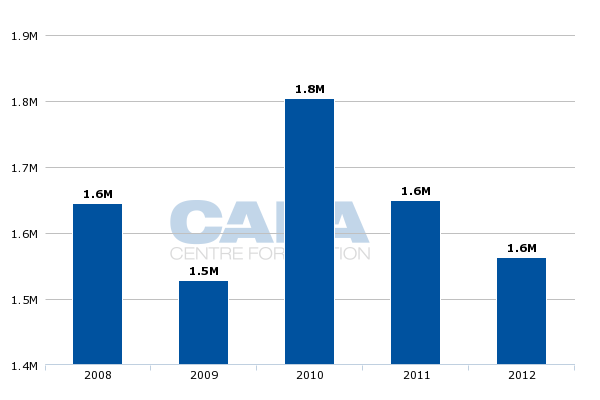 Growth has been stronger in recent years, with 2010 seeing growth equivalent to seven daily flights a year, 17 daily flights in 2011 and eight daily flights in each 2012 and 2013. There has technically been consolidation amongst operators. In 2006 there were 24 carriers operating across the Pacific to North America; in 2013, only 22 remained. The intervening period saw consolidation through the Delta/Northwest and Continental/United mergers as well as the exit of Jalways, Magadan and Varig. But these are minor: Jalways is part of JAL, which is still present in the market, while Magadan and Varig had trivial capacity (Magadan operated from the Asian part of Russia to Alaska, so technically was trans-Pacific capacity). By 2013 there had been new entrants in the form of Hainan Airlines, Hawaiian Airlines and Sichuan Airlines – far more substantial carriers. So, excluding the small carriers and grouping Jalways with JAL, only two carriers exited due to mergers but three new carriers entered. The chart below consolidates the mergers and affiliated carriers, like Air Japan with ANA. Note: Varig's 2006 frequencies, only eight, are barely distinguishable. Airlines that have merged are listed under the surviving brand name in 2013. Not every carrier can attest to growth. China Airlines, JAL, Malaysia Airlines, Singapore Airlines, Thai Airways and United Airlines have fewer frequencies in 2013 than they had in 2006. Southeast Asian carriers – with overall little capacity – have been particularly challenged to operate to North America given their inability to have sustainable non-stop services (Thai Airways withdrew its non-stops and Singapore Airlines will follow suit later in 2013). 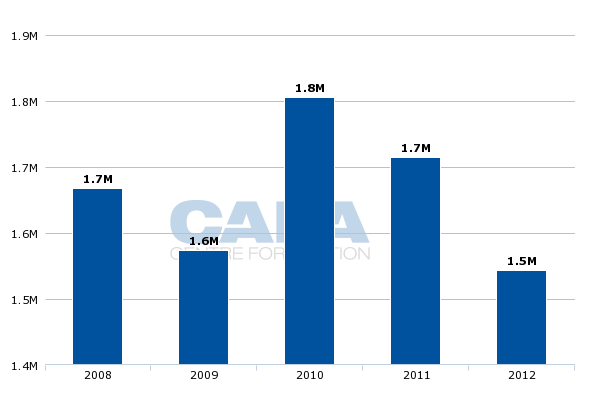 JAL reduced frequencies during its bankruptcy proceedings but is growing again. The highest percentage growth in frequencies has been achieved by Air China (69%), ANA (90%), China Eastern (174%) and China Southern (135%), but for China Eastern and China Southern especially, this has been from a small base. The largest growth in absolute frequencies has been delivered by Delta (2,592 more one-way flights in 2013 than 2006), ANA (2,035), Hawaiian Airlines (1,817 but absent in 2006), Korean Air (1,504), Cathay Pacific (1,388) and Asiana (1,078). In 2006 the 747-400 flew 40% of all trans-Pacific flights; the entire family (including the 747-400 combi, which can carry more freight than the 777-300ER) had a 48% share. 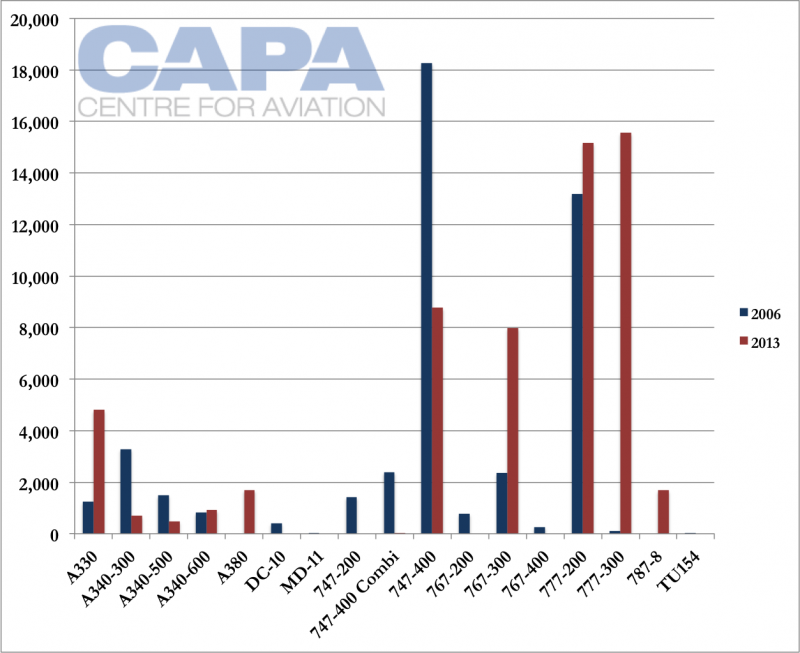 In 2013 the 747-400's share is down to 15% and the 747-400 combi less than 1%. Working against the 747 is its fuel inefficiency, rising maintenance costs and superiority of other aircraft, namely the twin-engined 777 and especially the 777-300ER. In 2013 all 777-300 trans-Pacific flights were operated by the -300ER variant. Note: Due to rounding figures will not necessarily equal 100%. Aircraft listed includes variants, e.g. -300ER for the 777-300. A330 not broken out due to data limitations. The leading change in the market has been the 777-300ER. In 2006 it accounted for less than 1% of frequencies but in 2013 is at 27% – more than the 747-400. While airlines are expanding with the 777-300ER, they are also using it as a 747-400 replacement, as Air China, ANA, Cathay Pacific, EVA Air and JAL, amongst others, have done. Large freight and passenger 747 operator China Airlines will soon replace its 747s with 777-300ERs, while China Eastern is replacing A340-600s with 777-300ERs. The implication for the cargo industry is that the 777-300ER carries about 18% more cargo volume than the 747-400. So not only are airlines growing frequencies and thus belly space, replacing a 747-400 with a 777-300ER leads to a significant increase in cargo capacity too. 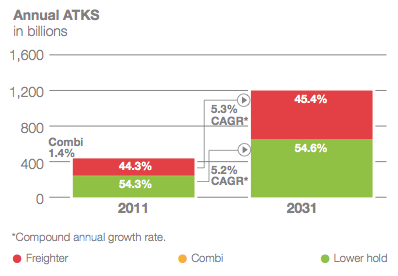 Some growth in 777-300ERs has been offset by the near retirement of the 747-400 combi. Note: Aircraft listed includes variants, e.g. -300ER for the 777-300. A330 not broken out due to data limitations. A second trend is frequency growth outpacing ASK growth. Where frequencies have grown 25% from 2006-2013, ASKs have grown at a smaller rate of 15%. The 777-300ER is part of the story as it carries fewer passengers than the 747-400 it is often replacing, but there is an increase in the number of medium widebodies across the Pacific. The A330's share of frequencies from 2006 to 2013 has grown from 4% to 8%, the 767-300 from 5% to 14% and the young 787 has nudged in with a 3% share. 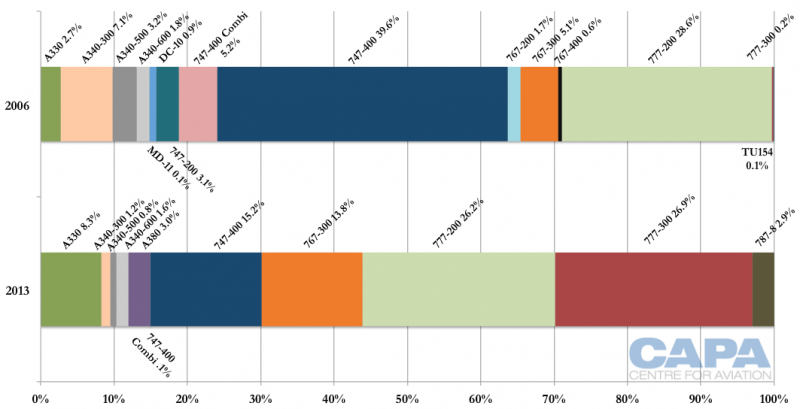 The 747 and 777 families in 2006 had a 74% share of the total trans-Pacific market, but in 2013 they had only a 68% share. This trend will grow more prominent as carriers take more deliveries of 787s and A350s. This makes it difficult to reconcile the trans-Pacific freight growth forecast (5.7%) with the passenger growth forecast (6.5%). Although this is not a normal comparison, it can approximately indicate if there will be greater belly capacity, impacting the demand for dedicated freighters. What makes the comparison difficult is that passenger projections are based on RPKs. Previously, growth of 700 daily passengers would be transported on two 747s, but in the future those 700 additional passengers are more likely to be carried on three 787 or A350 flights. Those three flights will likely carry more combined cargo volume than the two 747 flights would have. So belly growth will outpace that of the passenger cabin. So how much belly capacity has been added to the market? Looking at the volume capability of aircraft is not an exact reflection of capacity as aircraft can max out on weight before cargo volume, but volume gives an approximate indication. From 2006 to 2013 cargo volume increased 24% from 7.6 million cubic metres to 9.4 million cubic metres, based on scheduling data and airframer information. Looking at average capacity per flight across the airlines in the market can be misleading as the average figure is diluted by carriers like Delta that have grown frequencies on aircraft like the 767-300 that have less room for cargo. It is more on topic to examine the carriers that have replaced 747-400s with 777-300ERs, and these are also some of Asia's – and the world's – largest cargo operators. Korean Air would have seen at least a 6% increase in volume capacity per passenger flight across the Pacific from 2006 to 2013 as it cut 747-400 flights from 2,221 to 510 in favour of the 777-300ER, according to OAG. Shifting its remaining 747-400 flights to 777-300ERs would see it gain another 1.75ppt, although overall some growth is offset due to A380s having limited room for freight, due in part to passenger bags. Cathay Pacific, which swiftly moved to a majority 777-300ER operation in North America in 2013, would have seen its average volume per flight grow somewhere in the order of 15%. This growth in belly space comes as the airlines have seen flat to negative cargo growth (reported in weight, not volume). Yet the cargo fleets have grown, from 31 to 37 at Cathay from the end of 2006 to 2012 and from 20 to 27 at Korean Air during the same time period, although lately the cargo fleets have been purposefully under-utilised. The 777-300ER's growth will continue. As of Aug-2013 there are 304 777-300ERs on order, with 87, or 29%, of them announced as being for Northeast/Southeast Asian airlines. These figures include an order for 20 from China Eastern and 10 for China Southern that await official government approval. Not all will be used for North American services, but 777-300ERs at North American carriers – Air Canada and American Airlines – will increasingly find their way over the Pacific, to say nothing of other aircraft types like the 787 on order. Discussing the tens of thousands of annual trans-Pacific flights brings the numbers out of focus. To pull them back in, consider that since 2006 the Northeast/Southeast Asia to North America passenger market has grown on average by four daily flights every year. Considering fleet plans and anecdotal network expansion gives a sense of the large growth to come. China Eastern plans to add a daily service to each Los Angeles and New York and then look at new North American points – that would comprise a year's growth in the market, and this is just from one airline. ANA and JAL have used 787s to open daily service to four new US cities: Boston, San Diego, Seattle and San Jose. With 81 787s on order, ANA and JAL are still on their appetiser. Outlook: Airlines seek lower risk exposure – are large freighters too volatile? 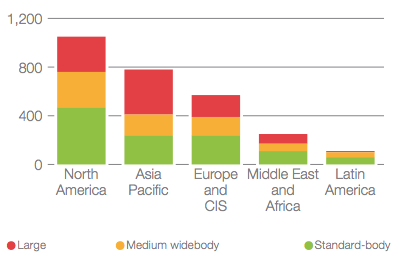 A 5.7% FTK growth in the Asia-North America market does not necessarily correlate to 6% freighter aircraft growth. 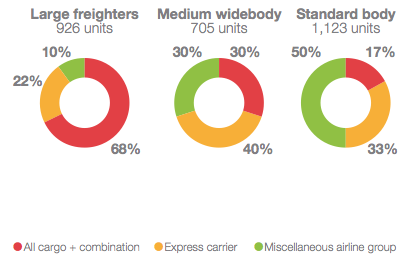 Globally, 54% of cargo ATKs in 2011 were available in passenger aircraft bellies, 44% in dedicated freighters and 1% in combis (this holds true at Asia's major cargo operators: Cathay sees about a 50:50 split). Airbus and Boeing forecast growth in the global cargo fleet by 2,600-2,800 aircraft, even factoring in large belly spaces on passenger aircraft. 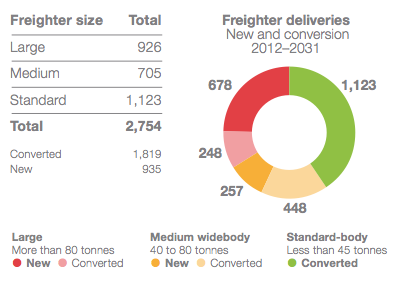 Both forecast only one-third of deliveries will be new-build freighters; the rest conversions. Boeing expects 75% of those new-build deliveries to be in the large aircraft size, like the 747 and 777. The express sector will surely see robust growth in freighters. 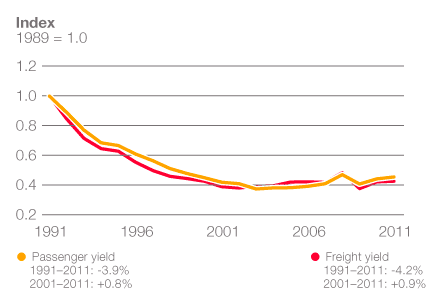 But in markets with growing long-haul capacity, freight is especially challenged. Some markets require dedicated freighters, like the China-US market Qantas has fifth freedom rights on, or the Chinese city of Zhengzhou, a manufacturing hub for Apple with huge freight demand but small passenger traffic. Zhengzhou sees only eight weekly widebody passenger flights (all from Taiwan, no doubt more relevant for electronic components in the belly than passengers in the cabin) but cargo flights from no fewer than six cargo carriers, three of them with 747s. While belly cargo can be offered at a lower unit cost than in a dedicated freighters, Boeing expects a strong future for new-build freighters as they bring a higher yield with their "superior focus and control, timing and routing, capacity (volume, weight, hazmat, and dimensional), handling location and ramp proximity, and, most importantly, reliability and predictability", the manufacturer says in its 2012-2013 World Air Cargo Forecast. For an alternative view on the expense of a freighter versus the lower revenue but more profit on a passenger aircraft, consider ANA, which overnight operates some freight flights on passenger aircraft without any passengers. Airlines are increasingly risk-averse as uncertainty becomes the new norm. Fewer carriers will want large and expensive freighters sitting around with the occasional short spike; a strong 2010 off-setting a disastrous 2009 or 2012. As carriers favour consistency, returning their cost of capital and not having to explain to shareholders large swings in performance, experiencing the good times may no longer be worth suffering the bad times. China Airlines, with 21 747 freighters (including three parked, according to CAPA's fleet database), wants to reduce its revenue reliance on freight from about 50:50 to closer to 30:70 in favour of the passenger business; growth is planned in the passenger business but the carrier also plans to pull-down freighters. A part of this plan involves replacing 747-400s with 777-300ERs, of which it has ordered 10. Some carriers surely wish they had already reduced their reliance on freighters: Singapore Airlines' SGD284 million (USD222 million) FY2012/2013 operating profit at its SIA and SilkAir passenger divisions was soured by a SGD167 million (USD130 million) operating loss at its cargo division. Moving some traffic from dedicated freighters to a growing number of passenger flights is feasible. Already the proliferation of widebody passenger flights on intra-Asia services provides the equivalent of over 50 weekly medium-widebody freighter services in the top 10 intra-Asia markets, according to Boeing. 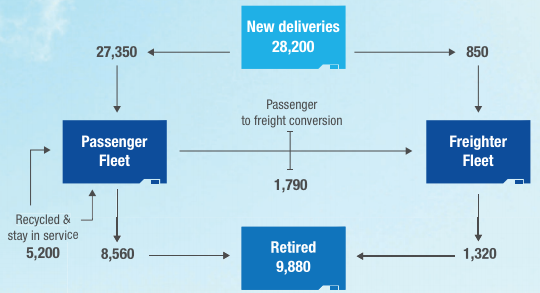 That point of favouring passenger over dedicated freight service may already have arrived in other markets but airlines are still determining if the trend is a long term one - or if dedicated freighters might enjoy a few more hurrahs. In 1H2013, Cathay's freighters covered cash costs but not full financing costs. On the revenue side, after a decade of rapid decline, global freight yields increased 0.9% between 2001-2011, but mostly due to fuel and security surcharges, according to Boeing. The airframer expects yields to resume their decline, partially as newer and more fuel-efficient aircraft enter, lowering costs by 1% per annum. Despite there being only 170 large freighters in service or in storage with Asia-Pacific airlines in Aug-2013, according to CAPA's Fleet Database, Boeing forecasts Asia-Pacific by 2031 to take about 400 large freighters – about 40% of total large freighters to be delivered by 2031. That leads Boeing to conclude, "the large freighter category consequently enjoys the highest potential for new freighter market growth". But the corollary is surely that the segment also carries with it a higher risk profile. Airbus has cancelled its planned A380F while Boeing since 2005 has amassed only 67 global orders for its 747-8F and 127 orders for the 777F. The A330-200F, considered a medium widebody freighter, has only 52 orders. As consolation there is the alternative prospect that a negative freighter story will provide a stronger passenger aircraft story. 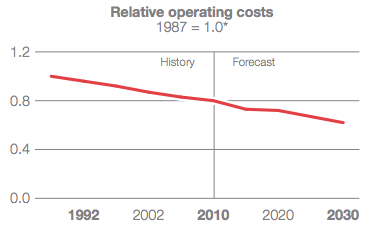 The possible result: a more robust and sustaining airline industry.